Stan Lair said: "On the corner of Main and Spring was John Lambert Grocery Store, later a harness store run by my father, Leroy Lair, and later it was E. T. Walker's Paint and Hardware, and is now Issokson's Cleaners. This building is the site of the old Baptist Church. It was on this spot before it was destroyed by fire in 1883. The fire wiped out all of our Main Street." 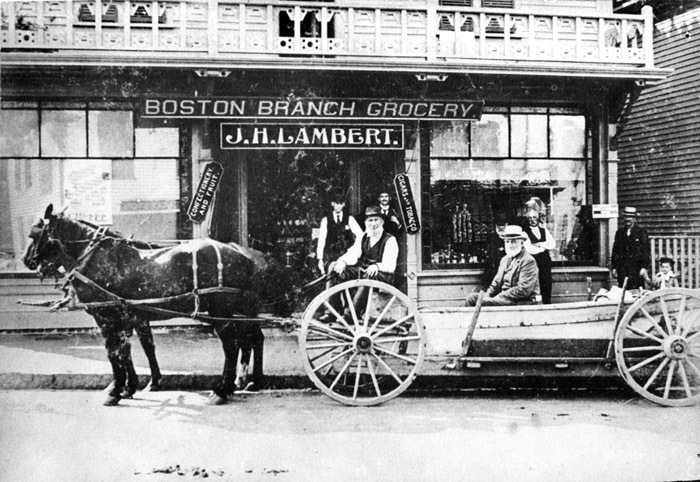 J. H. Lambert's Boston Branch Grocery, c. 1894, looking north. The intersection of Main and Spring streets is in the foreground. Dr. Butler's office is visible on the right. 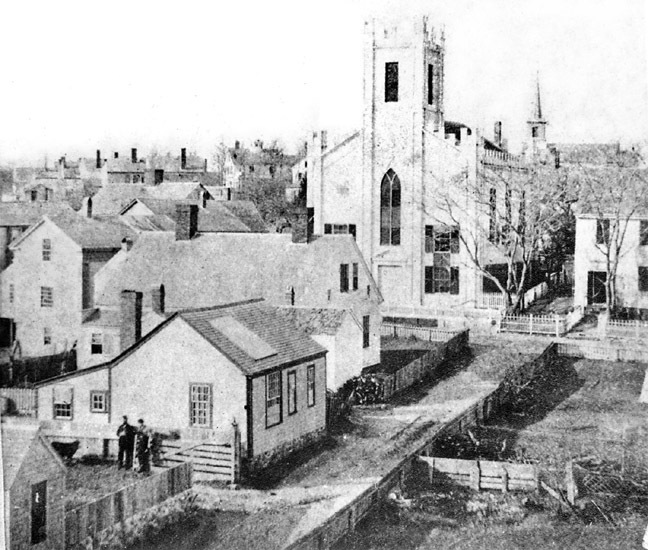 Before the 1883 fire, the Baptist Church stood at this site. It was actually the second Baptist church at this site the first was built here during 1788-91 and eventually fell into decay, and the second built on the same spot in 1837 at a cost of $4500. (Was this the "first church at Martha's Vineyard" mentioned in a 1914 Gazette article (when they found the key to it), built in 1704 in Holmes Hole and which burned about 1835, evidently adjacent to the Branscomb family's home?) In February 1882, the Gazette reported the publishing of the pamphlet "History of the Baptist Church, Vineyard Haven, Mass." by Rev. J. Coker, pastor. It was printed on the press of E. H. Manter (See Site #___.) J. P. Farrar was pastor from 1883-1887. John H. Lambert (1842-1916) was the son of mariner William M. Lambert and Betsy W. Hancock of Chilmark. In October 1883, he bought the burned lot where Baptist Church stood for $670 at public auction, and later the same month began work building a new store on the site of the old church. The Gazette reported that Lambert's new building was "a handsome one" and that the upper part was to become eight or ten "lodging rooms to let." On October 18th, Lambert sold the north end of the lot to Dr. Winthrop Butler (see Site #24.) Lambert's new northern boundary was only four feet north of the underpinning of his new store. By November 1883 the new building was taking shape. According to Gazette reports, John H. Lambert's new corner store was "very pretty" with "two immense plate glass windows in front" and "stained glass lights at side and bottom of sashes." He built one entrance on Main street and another on Spring street. The same month Lambert bought the lot on Spring Street adjacent to the rear of his property from Benjamin and Rebecca Merry for $200. By early 1884, J. H. Lambert's new dry goods store was open, and in May 1884 he opened a millinery department with Mae M. Robinson in charge. By July 1886, Aurie C. Hursell was employed as the clerk at Lambert's dry goods store. In August 1887, the Gazette made reference to "the new concrete on Main St. near J. H. Lambert's store." and in November 1887 they reported that part of Spring Street was being concreted. In August 1887 the Village Improvement Society put up six street lights and helped fund the concreting of Spring St. from Main to William. 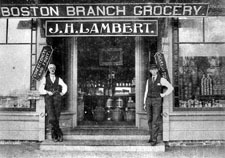 In July 1890, E. L. Eagleston withdrew from the Boston Store business to open the New York Store in Hyannis, but his brother A. P. retained management of their dry goods store. In January 1891, The Boston Store advertised "Ladies' and Misses' garments." 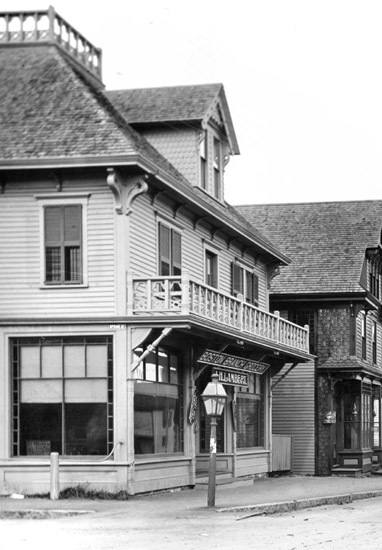 In August 1891 workmen broke ground for the foundation of the new Boston Store elsewhere on Main Street, into which A. P. Eagleston moved his business about the end of November 1891. 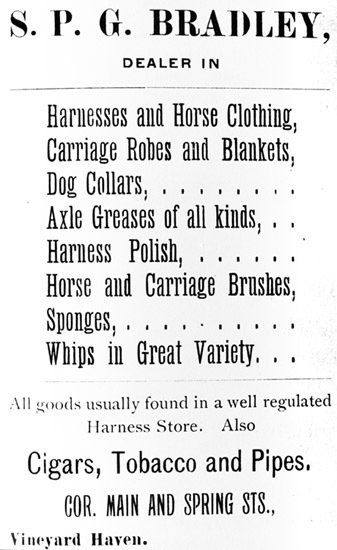 In August 1891, Louis Rosskoff was hired to work at the Boston Store. Lambert's grocery store. 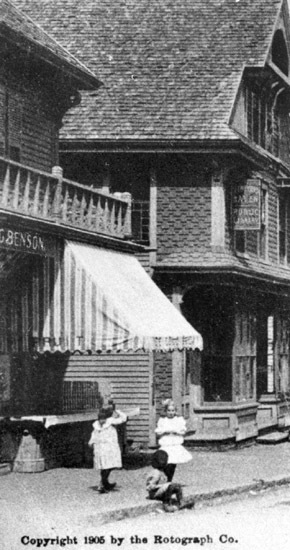 In the reflection in the window on the left the word "Eagleston" is just visible on the building directly across the street, where Mosher Photo is today. In May 1892, the WCTU, leading a cause to light the streets, voted to remove a lantern from Mr. J. Lambert's yard to the corner of Main and Spring Streets. In May 1892, the Gazette reported that an Edison phonograph at John Lambert's store was "giving lots of entertainment." In March 1893 the Gazette reported that John Lambert's store room was painted. 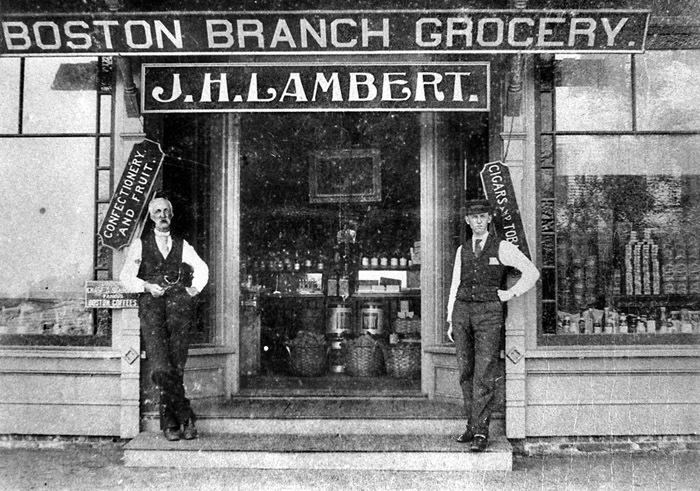 In December 1893, the Gazette reported that John Lambert was preparing to open a grocery store at the corner of Main and Spring Streets. John Lambert is on the left. In April 1896 the Gazette reported that "Mr. Timothy Shugrue will open the store on the corner of Main and Spring streets, some time this month, with a full line of gent's furnishing goods." Timothy Shugrue (1862-1907) came to Vineyard Haven during the 1870s, and was working as a 17-year-old harness maker for Rodolphus Crocker in 1880 as well as living in Crocker's home. He married Mary E. Bandoin in Tisbury in 1886. The 1897 Vineyard Haven directory lists both a millinery shop of Mrs. Catherine W. Tilton (wife of Ernest L. Tilton -See Site #___) as well as the undertaking parlor of Moses C. Vincent on the corner of Main and Spring Streets, although it is unclear which corner(s) these were on. According to his obituary, Sylvester Bradley worked in Crocker's harness factory for many years before going into the harness business for himself. He was listed as a "harness maker" in the 1880 Tisbury census. S. G. Bradley had a house and store which survived the 1883 fire. 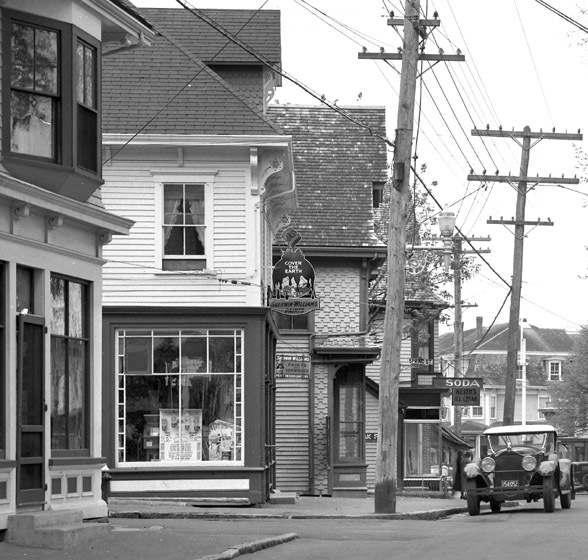 The only store in Vineyard Haven to survive, it was evidently on Water Street. The 1897 Vineyard Haven directory lists S. P. G. Bradley on the corner of Main and Spring streets as a harness maker and dealer. 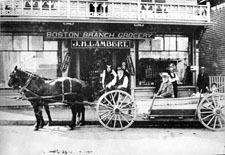 On Feb. 4, 1899 the store of John H. Lambert on the corner of Main and Spring streets was sold to Miss Florence A. Smith of Tisbury. Three weeks later, on Feb. 28, 1899, Florence Smith sold the same "valuable estate" to Sylvester P. G. Bradley of Tisbury, and the Gazette reported that the "tenants" were "expected to change." Sylvester Bradley carried on the harness business at the "Lambert Block" until his death in May 1900, having lived his entire life in Vineyard Haven. On May 31, 1900 Sylvester Bradley's widow Catherine and their two children Herbert and Nellie sold this property to Mrs. Eunice R. Beetle. Mrs. Eunice R. (Lambert) Beetle (1824 - 1914) was born in Strong or Norridgewock, Maine, the daughter of Levi and Eliza Lambert. She came to Martha's Vineyard at age fifteen and taught school in Edgartown. She married ship chandler Richard Beetle (c.1802-10 - 1886), originally of Edgartown, who later became a Tisbury farmer. Mrs. Beetle had a life-long interest in business and real estate. In May 1882 she opened a millinery line in "the store owned by J. M. Taber and lately occupied as an express office." She moved her millinery establishment to Falmouth later the same month. 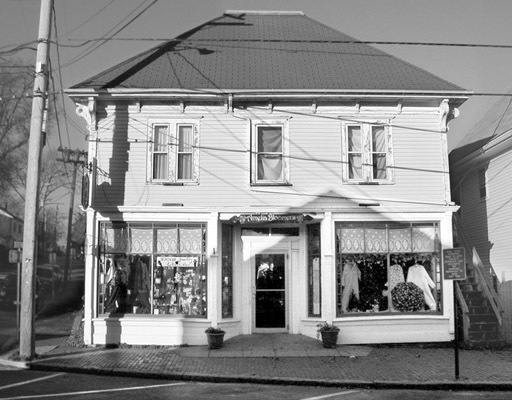 In April 1887 she opened a millinery store on Main street at the store of E. H. Manter in Lane's Block, and moved her business to Falmouth the following month. In October 1887, she was in the millinery business in Falmouth. By 1897 her millinery business was listed on the corner of Main and Centre streets. In June, 1900 Mrs. Eunice Beetle sold this property to her son-in-law Dr. Edward Roth (1859 - 1919). Dr. Roth was the assistant of Dr. Stewart at the Marine Hospital in Vineyard Haven sometime before 1883, and by 1883 was practicing in San Francisco, where he married Eunice's daughter Eliza L. Beetle (1854-____). They were the parents of Major Edward Roth Jr. (1883 - ). The Roth family was living in Holliston by July 1888. Dr. Edward Roth died March 1919 in Miami, Florida. In Feb. 1920, widow Eliza L. Roth sold this lot and building to Mrs. Arabella M. Walker. Capt. 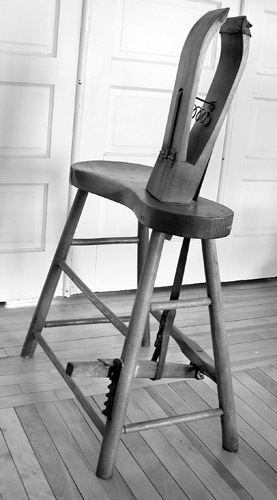 Leroy C. Lair's Harness Bench. Capt. Leroy Lair evidently took over the harness shop at this site following Sylvester Bradley's death in May 1900. Capt. Leroy Crosby Lair (1869 - 1955) was born in Mattapoisett, MA, the son of French seaman Peter J. Lair and his wife Fannie Bradford Fish. His father abandoned the family and moved to the west coast when Leroy was a toddler. He came to the Vineyard as a boy with his mother, stepfather, and brother Carlton. 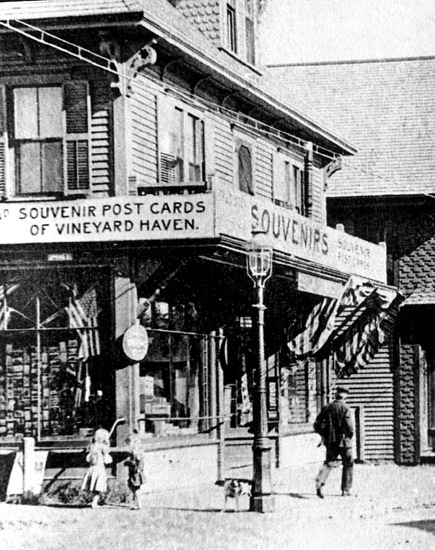 He was called a Vineyard Haven "harness maker" in 1889 and 1891 town records. He and his brother opened a fish market in 1894, probably on Water or Union Street, but it is unclear how long it lasted. He was again listed as a Vineyard Haven "harness maker" in November 1894 and in the 1897 Vineyard Haven directory. In December 1898 the Gazette reported that "Mr. Leroy Lair is putting up a new place of business on Main Street, next to the Eagleston Bros.' store." and in January 1899 that Lair was "finishing his new store on Main Street and is already occupying it." It's unclear where this was. The April 1900 census lists Capt. Lair as a "harness merchant." It is likely that Capt. Lair took over Bradley's harness shop in June 1900, when the Gazette reported that Frank Golart had moved his "bicycle hospital" to the "shop recently vacated by Leroy C. Lair." The same month it was reported that George Walker was working as a clerk for Lair. On June 28, 1900 the Gazette reported that the rear room in Bradley's Block had been converted into a boy's clubroom with billiard and pool tables. In September 1901, Dr. J. S. Lawton, an eye doctor, advertised his business at L. C. Lair's. In December 1901 it was reported that Capt. Lair gave a supper in the billiard room to his club, and in February 1902 that Lair gave a supper in his billiard room "at which a number of tug captains attended." Capt. Lair's son Stan Lair remembered: "He was in several business. He was in the trucking business at one time. He came here as a harness maker, worked at the Crocker Harness Shop. He ran a fish market at one time, he had a little cat boat he ran for partying, he had various things. He had a license for steamboating. He was a yachting skipper for several years for the Fuller family on East Chop, and other people." "At one time he got the idea of peddling hulled corn. I hated the stuff. He would boil the stuff on the stove, and he'd dump it in lye to take the husks off and all that stuff. I don't know how they made it, but anyway. I never liked that stuff. And lot of the people - the old timers - loved that. But anyway he would peddle that, he had a little automobile, and he would peddle around. I hated to meet him on a road, though! It didn't matter to him whether he was driving on the left side or the right side! I think he told me once he was coming back from Oak Bluffs and he looked out the side and he saw a wheel going along the side of him. One of the wheels had dropped off, or something, going along right along side of the car." In November 1902, Capt. Lair sold his business to Charles Benson, and was reported to be "running a harbor boat, the little steamer Marion H., for the sale of goods down the harbor. This sort of barter has not been as common as it was years ago when many were engaged in the bumboat business." Capt. Lair was married to Marion Hodge West (1869-1943; the daughter of Abner West and Sarah Hodge.) Their children were Fanny Smith (Lair) Downs, Carlton Purrington Lair 2nd, and Harold Stanton "Stan" Lair. Marion Hodge West also had one illegitimate son, reportedly by "Barber" Hammond (See Site #20): Ralph Crosby Lair (1900-1965). In November 1902 it was reported that Charles E. F. Benson had "leased the large store corner of Main and Spring streets, having bought out the stock of Mr. Leroy Lair." Charles E. F. Benson (1859 - 1930), came to Martha's Vineyard as a boy just before 1870, when he was boarding with Vineyard Haven ship carpenter Charles Gifford. Benson married Sophronia B. Luce (1858 - 1957) in 1879. He appears in the 1880 census as a "laborer", in the 1897 directory as a "gardener," and in the 1900 census as a "house carpenter." According to Benson's obituary, he twice opened "combination poolrooms and confectionery stores" on Main Street. Could this store have been one of them? By 1907, Legrand Lockwood Aldrich (c.1887-8 - ?) was advertising phonographs (and "graphophones"), billiards, post cards, fountain drinks, cigars, and a telephone pay station at the corner of Main and Spring streets. Lavinia F. Brush (1886-1958) was his clerk in 1907. She was the daughter of Vineyard Haven painter Samuel N. Brush and his wife Melvina Luce. She married West Tisbury painter Charles Hardenburg West in 1910. In December 1907, Miss Ethelinda Lewis rented rooms over Mr. Aldrich's store, having moved there from Lane's Block. In March 1908 the Gazette reported that Mr. George S. Chapman had "left town permanently and the telegraph business entirely. Mr. Aldrich, corner Main and Spring streets, being the operator, and the place of business the present telegraph office." In June 1910 the Tisbury selectmen granted a one-year license to Aldrich to keep one billiard table and several pool tables at his corner store for the purposes of "amusement" only no gambling. The selectmen also required that the pool room must be closed from 11 p.m. until 6 a.m. each night. 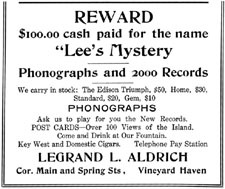 In the 1910 Vineyard Haven directory, Aldrich advertised auto supplies, phonographs, billiards, postcards, fruit, cigars and tobacco, as well as Indian Motorcycles, bicycles, and supplies and repair. They also advertised the office of the Martha's Vineyard Telegraph Company. 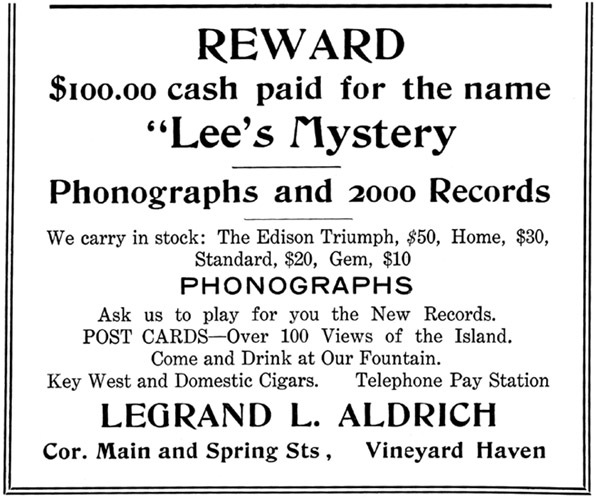 Town records also note that Aldrich worked for the Telegraph company during 1911-12. 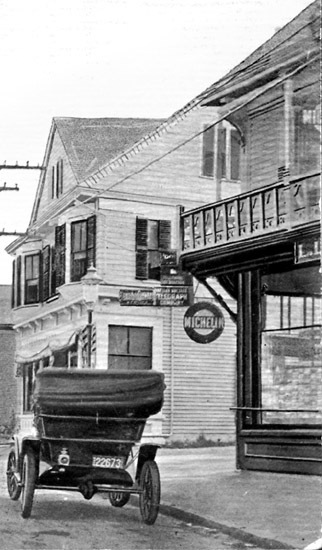 In June 1913, the selectmen renewed Aldrich's license to keep one billiard table and three pool tables in his corner store for another year. Ralph Look said about Aldrich: "They divorced, and [their son] Donald Aldrich picked up some sort of a bug - I don't know what it was - he died. Finally, I guess that after they left Dukes County. They went out to California or something. So I gather, I don't know." Aldrich's garage at Five Corners later became the Dukes County Garage under William G. Manter. SL: Well, E. T. Walker ran a paint store. I think originally he worked for a man by the name of Jenkins who had a paint store up on the corner, where Brickman's toy store is now that building. But he eventually moved down to the corner of Spring and Main and opened up that paint store and hardware store. He lived down on Grove Avenue, halfway to West Chop. He had George Walker, Harry Walker two boys. And I think Howard Whitney worked there at one time. BW: Yeah, and Ernest Campos worked there. SL: So what do you know about George Walker, his son? BW: Well, I know George, George lived on the corner of the State Road and the Edgartown Road, the big white house on the right as you go up the Edgartown Road. I guess he did a lot more running the store than Harry did. Well, you'd never know he was a store owner, you saw him with paint-spattered clothes and hat sitting sideways on his head. I guess he'd rather be out working than running the store anyway. He was always busy, but he was always very accommodating, too. Eugene Tenny Walker (1852-1938) was born in New Hampshire. His family moved to a Kansas homestead when he was a boy, but Walker later returned east and worked for a paint manufacturer in East Boston, and traveled for the National Lead Company. In 1872 he was working as a "shoecutter" in Milford. In 1876 he married Arabella Maria "Belle" Carpenter (c1851-2 - 1940), the daughter of Byron and Jane Mason Carpenter of Milford. In 1880 Walker was working as a salesman in Milford and living in nearby Hopedale, and by about 1886 they were living in Franklin, MA. 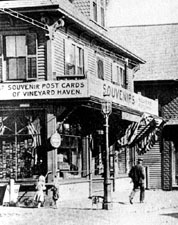 They settled in Vineyard Haven about 1890, where his brother lived. He worked for a time in Oak Bluffs as a painter and fisherman before returning to the paint business. The 1897 directory lists Walker as a "salesman" living on Grove Ave., and the 1900 census describes him as a Vineyard Haven house painter. 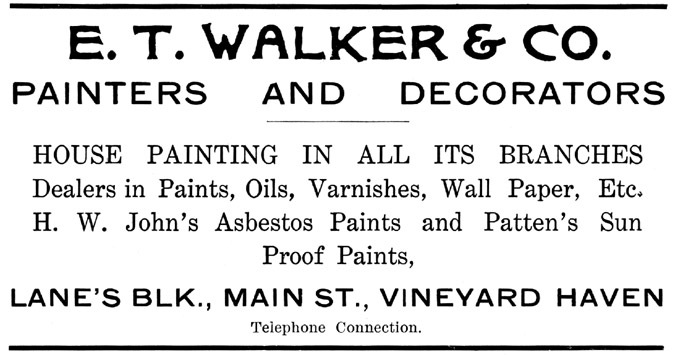 The 1907 Vineyard Haven directory lists the E. T. Walker & Co. business at Lane's Block, dealing paints, oils, varnishes, and wall paper. 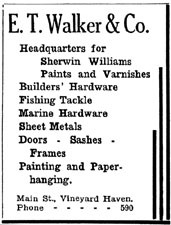 By 1910, E. T. Walker & Co. was advertising as "Successors to F. H. Jenkins," and the location was listed in the 1910 directory as both "Lane's Block" and as "South Main, near Beach rd." Walker evidently bought out Foster Jenkins' painting business about 1907-10, and was located for a period in Jenkins' old shop (See Site #16.) In January 1910 Foster Jenkins leased the lower part of his building to Walker for three years for $25 per month with the option to buy it for $5000. By the 1910 census, Eugene's sons George W. Walker and Henry E. Walker were also working as painters. It's unclear when Walker moved his business to this site, but it was undoubtedly between 1910 and 1914, when the Sanborn map marks Jenkins' former shop as "vacant" and this site as "Paints." 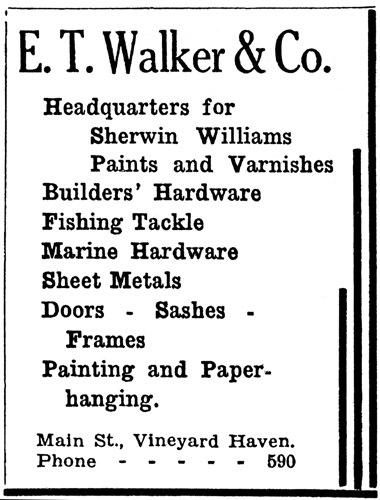 By about 1920 Walker was advertising doors, sashes, blinds, mouldings, paints, oils, varnishes, wall papers, chemicals, builders' hardware and glass, as well as offering painting, decorating, hardwood finishing services. The Gazette noted that "During the busy season twelve men are employed." Walker's son Henry was also in the painting business at this time. In February 1920 the owner, widow Eliza L. Roth, sold this lot and building to Eugene's wife Arabella M. Walker. By March 1926 E. T. Walker & Co. was advertising wallpaper, paint, and hardware. In February 1928, the Gazette reported that E. T. Walker had enlarged the shop and the apartments above and around the corner. By 1934, E. T. Walker turned the business over to his son George Woodbury Walker, who continued the paint and hardware store and painting and decorating business, and the following year his mother Arabella deeded this property to George. (By July 1926, E. T.'s other son Harry Walker, a former Tisbury selectman, was selling real estate in Florida.) E. T. Walker died Sep 7, 1938 in Vineyard Haven. His obituary called him a "master painter." A relative of the E. T. Walker's wife writes of Walker: "Gene was considered a skeleton in the closet of the Carpenter family (even though he was only just related by marriage). Uncle Gene had been known as a member of the Socialist Party a crime to a family of staunch Republicans." Looking north on Main Street - late 1930s. 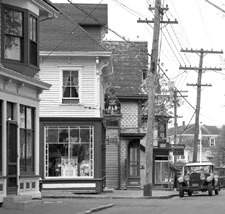 By the late 1930's George's nephew Walter H. Renear was working in the hardware and paint store. Walter Renear writes: "George Woodbury Walker was my uncle by marriage, he married my aunt Frances Rockwell Renear. Harry was George's brother and I suppose that his real name was Henry. His was very thin and wife was very fat, a real Jack Sprat couple. He lived in the first house on the left as you go down Grove Avenue." In 1940, Eugene's widow Arabella Walker died. In her later years she wintered in Florida, where she died at Coconut Grove in 1940 at the age of 88. In January 1953, George Walker sold the painting and decorating part of the business to Ernest L. Campos and Thomas DeMont, who continued under the name E. T. Walker Contracting Co. This firm was operating as late as 1959. George Walker and his wife retired to Florida, where they ultimately died. It is unclear exactly how long the business continued under Gaffey's management, but the business evidently folded at this site between 1959 and about 1962. In August 1960 George Walker deeded this property to Renear Ford Sales Inc. In November 1977, Samuel B and Yale Issokson sold the property for to Bruce L. Levett and Barsha L. Tolin. 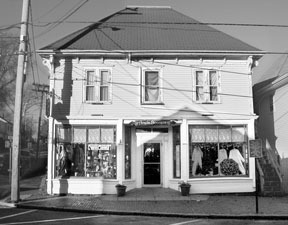 By 1985, the store was occupied by Amelia Bloomers, under the management of Diane Hartmann. Later, management was taken over by Linda Carroll.